In ancient times, centuries before the days of modern biochemistry, healers in the East used sensitive observation to develop highly sophisticated systems for promoting health, longevity, and healing. They saw the world through a holistic lens in which mind, body, and spirit participated in the same vital force energy (“Qi,” pronounced “chee”) and in which everything interrelates—working as interdependent parts to create balance and harmony within the larger universal system. Qi was the prime mover, the vital energy that pervaded all things. In contrast to the focus on physical matter in the West, Chinese healers adopted an energy-based medicine that defined health states and healing strategies in terms of energy/Qi. It is fascinating, with their focus on Qi more than two thousand years ago, that Chinese healers implicitly recognized the modern quantum physics concept of complementarity—the ability of an entity to be simultaneously two opposite things. Through quantum physics and particle/wave theory, we in the West are beginning to appreciate and incorporate into our thinking the duality-dance of matter and energy, and, with it, the important role that energy medicine can play in supporting and prolonging physical health. 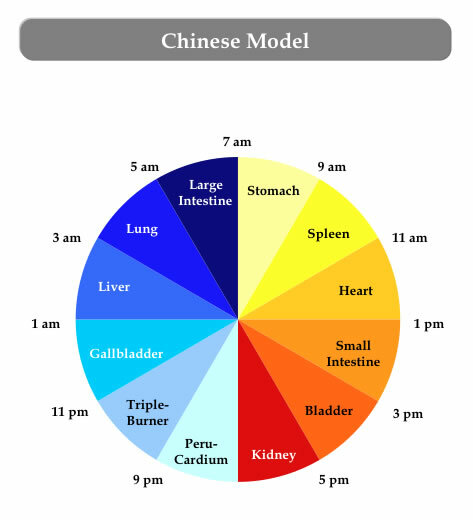 For some time, I have been fascinated by Chinese Five Phase theory and the Body Clock. Both models present with economy and simplicity wisdom distilled over centuries. Now that these models are familiar to me, I find myself turning to them time and again. Five-Phase Theory (see earlier newsletters) incorporates extensive wisdom about mind-body states and how these correspond to organ systems, seasons of the year, elements, and foods. The Body-Energy Clock, our subject here, is built upon the concept of the cyclical ebb and flow of energy throughout the body. During a 24-hour period (see diagram that follows) Qi moves in two-hour intervals through the organ systems. During sleep, Qi draws inward to restore the body. This phase is completed between 1 and 3 a.m., when the liver cleanses the blood and performs a myriad of functions that set the stage for Qi moving outward again. In the 12-hour period following the peak functioning of the liver—from 3 a.m. onward—energy cycles to the organs associated with daily activity, digestion and elimination: the lungs, large intestine, stomach/pancreas, heart, small intestine. By mid-afternoon, energy again moves inward to support internal organs associated with restoring and maintaining the system. The purpose is to move fluids and heat, as well as to filter and cleanse—by the pericardium, triple burner (coordinates water functions and temperature), bladder/kidneys and the liver. When one organ is at its peak energy, the organ at the opposite side of the clock, 12 hours away, is at its lowest ebb. For example, between 1-3 a.m., the liver reaches its peak, doing its work to cleanse the blood, while the small intestine, the organ responsible for the absorption and assimilation of many key nutrients, is at its ebb. What does this tell us? Principally, that it must be taxing to the system to deal with late night meals and snacking. The body is not programmed to accommodate the modern habit of late-night screen-based stimulation and the eating habits that go with it. When we eat late at night, food is not well absorbed by the small intestine and the liver has little opportunity to do its job of housekeeping. Liver: The liver stores and cleanses the blood, a fact that becomes more interesting as we consider personal experience. Have you ever partied too much in the evening, and awakened in the wee hours of the morning feeling “off” and unable to fall back to sleep? Chances are good that you were tossing and turning between the hours of 1 a.m. and 3 a.m. when your alcohol over-loaded liver was struggling to do its work. The timing of the liver’s peak activity also speaks to consuming the last meal of the day as early as possible. The liver’s daily programming assumes an early dinner and bedtime. Before electricity and the light bulb, people ate super and retired early, allowing time for the last meal of the day to digest so that the liver could be most effective in its peak hours of activity. The “work shift” of the liver, then, reinforces the concept of making the last meal of the day a light one that is consumed on the early side. The more time that passes after food is eaten before peak activity of the liver, the better the liver will be able to carry out its myriad of functions. I hope this brief overview of the Chinese energy model—something not common in our Western vocabulary—might help you think in new ways. When we honor the body’s inherent flow of energy, we work in harmony with its natural rhythms and avoid taxing it unnecessarily.